Kakina is a Free-to-use Wordpress theme built for Marketing purposes. 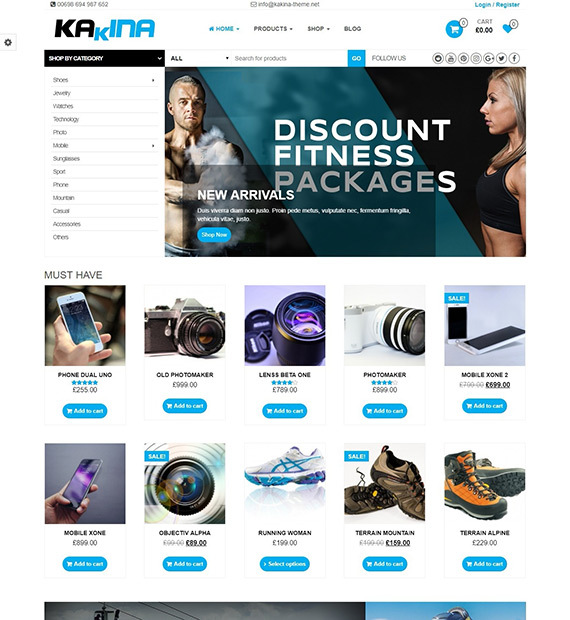 The WooCommerce based theme is perfect for many businesses such as Fashion Designing, Jewelleries, Food & Drinks, Sporting Fashion and many more. Built with customizing in mind, the Theme supports multiple WooCommerce plugins. Kakina contains various tools to make one’s WordPress look extremely eye-catching such as a Custom Slider, font awesome icons, custom backgrounds, product search bar and so on. The Bootstrap built theme is perfect for every user involved in eCommerce, from Aspiring Marketeers to Experienced Entrepreneurs. Deep and seamless integration with ‘WooCommerce’ – the most popular eCommerce platform in use. Feel the power of this awesome software & build a full-fledged eCommerce site. Add to the functionality of WooCommerce with the extentions available. Create the efficient and beautiful ecommerce site in no time. Explore the limitless freedom of web design with unlimted colors. Customize almost all areas of your website with your favorite colors and create sparkling a webpage. Compatible with the popular WooCommerce widgets that helps you easily set up the perfect eCommerce site. Own a business or eCommerce website? Integrate the pricing of your products and services on the in-built pricing page option of the theme.